The top-seeded Rangers easily advance to the regional final with a 56-38 victory. Greely looked and played like the No. 1 seed Thursday night in rolling to a 56-38 win over No. 4 Yarmouth in a Western Class B boys’ basketball semifinal at the Cumberland County Civic Center. The Rangers (19-1) will play No. 6 Poland (12-8) for the regional title at 3:45 p.m. Saturday. Greely was on the ropes last Saturday in the quarterfinals against No. 8 York before rallying for a 41-38 win. The team that began the tournament with high expectations was almost eliminated before the postseason got cranking. The Rangers were a different team against Yarmouth. They got their fast break going early, spotted open men for easy baskets and dominated the boards. 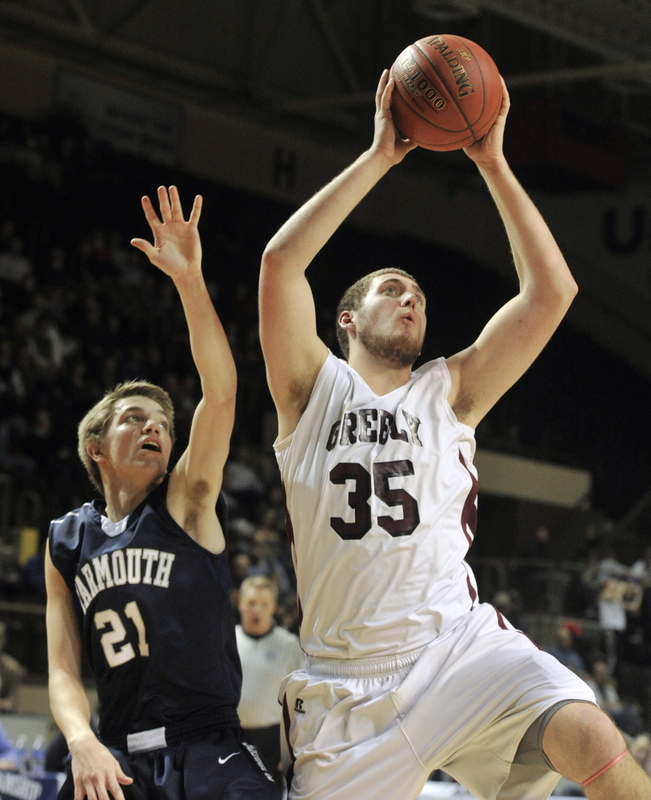 Mike McDevitt, Greely’s 6-foot-7 senior center, scored 19 points and pulled down nine rebounds. “Mike really cleaned the glass,” said Seaver. The Rangers put the game away in the second quarter, outscoring Yarmouth 19-6 to build a 34-13 lead. McDevitt had nine points in the quarter. Bailey Train found the range from beyond the 3-point circle, hitting four 3s for the game, including back-to-back 3s late in the third quarter. Greely went on a 19-3 run to close the first half. McDevitt started it with a basket off a rebound, and Train hit a 3-pointer. Others got into the scoring act, as the Rangers showed good balance. It didn’t help Yarmouth that its big man, Nate Shields-Auble, picked up his third foul with 3:23 left and went to the bench. The 6-foot-4 Shields-Auble is the only player who could challenge McDevitt or 6-foot-4 Kyle Wood. Shields-Auble picked up his fourth foul with 5:19 left in the third quarter and fouled out with just under three minutes remaining. Yarmouth got the first two baskets of the second half, by Ethan Gage and Shields-Auble, but the Rangers then scored the next 12 points. McDevitt converted a rebound and then hit two free throws. Train followed with his back-to-back 3-pointers. Yarmouth’s problems were complicated by cold outside shooting. They weren’t shy shooting 3-pointers, but they only hit three – one by Jordan Brown in the first quarter and two by David Murphy in the third. Connor Hanley finished with eight points for Greely. Murphy led Yarmouth with 15 points. Seaver was soon looking ahead to the regional final. “We pull out the tape tonight,” he said.